Riders couldn’t have imagined the horror they would encounter when they boarded the Sand Blaster roller coaster on a Daytona Beach boardwalk. The June 14 derailment resulted in incalculable terror for riders and onlookers alike, as the front car completely left the tracks. Two riders in that car plummeted 34 feet to the ground, while the other two riders hung on for dear life. The car dangled precariously from the track, putting everyone at risk. The Daytona Beach Fire Department was quickly on the scene rescuing riders, nine of whom were rushed to area hospitals. Tower truck ladders reached frightened riders while rescue workers coaxed them gently to safety. Meanwhile, police kept bystanders away from the scene for their own safety and to give firefighters the room they needed to get the job done. The Sand Blaster was manufactured over forty years ago in 1975, and has been here on the boardwalk since 2013. At its highest point, it climbs 85 feet skyward. According to Jennifer Meale, who is the spokeswoman for the Department of Agriculture and Consumer Services, the ride had passed a safety inspection that very morning. Previously, a number of deficiencies had been found, but those issues had all reportedly been taken care of. Now, an investigation is underway to determine what went wrong, and why. Over 30,000 emergency room visits were due to accidents on amusement park rides across the United States in 2016 alone. Inspections are supposed to keep rides safe, but clearly, this is not always the case. In Florida, the Dept. of Agriculture is responsible for everything from go-karts to zip lines. Rides require semi-annual inspections by engineers or other professional inspectors who must certify that state standards are met. Permits for operation may then be issued. Disfiguring injuries from falls or entrapment. 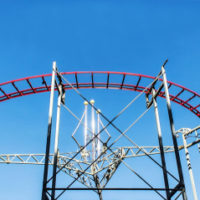 Who is Liable After an Amusement Park Ride Injury? Many factors can impact rider safety. Liability for injuries may lie with the manufacturer or designer of the ride, with the amusement park owner, or with other entities involved with inspections, operations, or maintenance or the ride. If your fun at the amusement park wound up sending you to the hospital with serious injuries, the experienced legal team at The Law Offices of Robert W. Elton can help. Let us investigate and pursue justice on your behalf. Contact us today in Daytona & Ormond Beach.